Sueca - thanoscardgamess jimdo page! Sueca is point-trick game with trumps played in Portugal and Brazil. 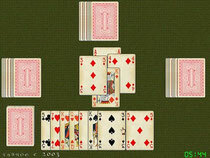 It is a game for four players playing in teams, two against two, with partners sitting opposite. It is played with 40 cards (whithout the 8s, 9s and 10s from a standard 52 card deck). The rank of the cards in each suit, from high to low, is: ace, 7, king, jack, queen, 6, 5, 4, 3, 2. The aim is to win tricks containing valuable cards. In this version you play it with two authentic card decks from Portugal and Brazil.